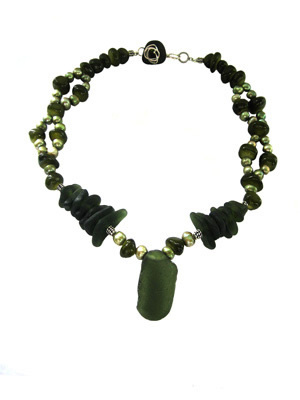 Olive dyed Jade and celery colored freshwater pearls indulges the rich olive green sea glass. 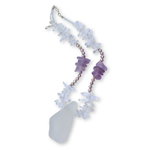 Along with Bali sterling silver spacers there are seven pieces of olive green sea glass that flank each side of the center sea glass stone which measures 1.5 inches in length by .75 inches in width. 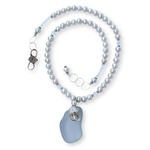 The handmade clasp is a hook style created with a deep olive sea glass nugget and sterling silver… Rich and Classic. 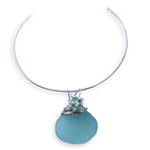 Sea Glass, Jade and Freshwater Pearl Sterling Silver Necklace.